The components represents the GO that will move trough a path of Nodes. It needs a Transform GOToMove (the actual Actor) that will modify, and a firstNode to start with. When the thruster is working (ignition on, no faults and throttle > 0) it begins to update the GOToMove properties (position and rotation/scale if needed). Programatically you can restart the path, after it reaches the end. It works with circular (infinite repeating) nodes too. !! The GOToMove must NOT have a Rigidbody with forces applied or other effects, or else the animations will conflict with the physics engine. The thruster is built for all GO that have a Transform (2D/3D but not UI elements). 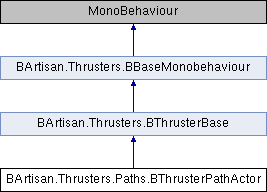 Referenced by BArtisan.Thrusters.Paths.Transition.Finished(), and BArtisan.Thrusters.Paths.Transition.Transition(). Set a new starting node and begins a new path. If the GOToMove is currently in a segment/path it cancel the current animations. It does not change the current position/rotation/scale. The next node to be visited is the firstNode. If the GOToMove is currently in a segment/path it cancel the current animations. It does not change the current position/rotation/scale. Fetch a list of nodes in the order they will be followed. If you modify dinamically the nodes connection this list will not be updated, you have to call it again. It does not support circular paths, meaning it stops adding nodes to the list when it finds a node that was already visited. The next-to be visited nodes, in order.